Tuesday morning we hopped on a tiny plane at the Burbank airport headed to Kansas City by way of Denver. I guess these little planes must be the new trend in air travel. Just before boarding I got myself a Guayaki mate latte. Score! We are here in Kansas City for an Artist As Brand workshop and the Spectrum Fantastic Art Live event beginning Friday. Cathy and Arnie Fenner, of the Spectrum Fantasy Art Annual, were instrumental in creating Spectrum Live as an alternative to the monster San Diego Comic Con. Back in time Comic Con was mainly centered around all things related to the world of Comics, now however, it's turned into an event focused on movies and related celebrities instead of the artists that created those brilliant Sci-Fi stories we all love. The art collector that once attended Comic Con no longer makes the journey, thus Spectrum Live. According to the website, four of the major hotels surrounding the KC convention Center this weekend are now full, which leads me to suspect the event is filling a very much needed niche market. The photo above is a shot of the Sky Stations sculpture created by RM Fischer, taken from our 13th floor hotel room window at twilight this evening. 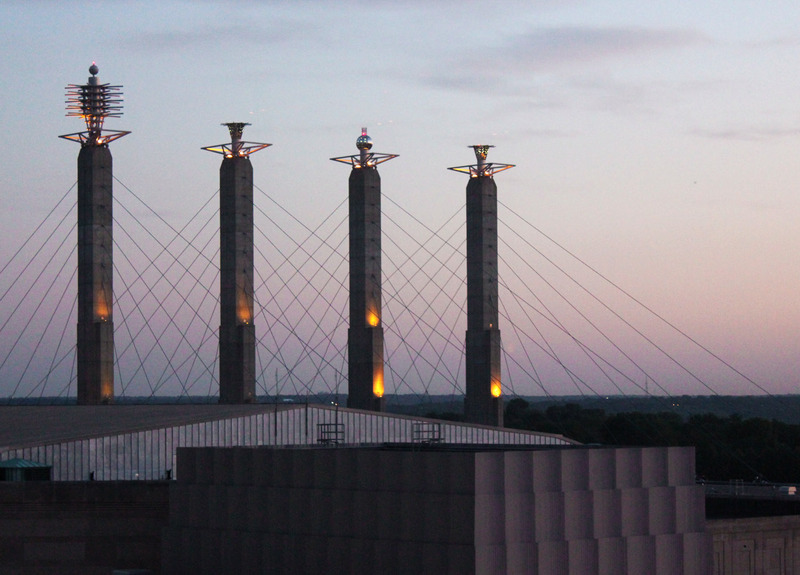 The four pylons are over 200 feet tall and measure 24 feet by 15 feet in diameter. In 1994 R.M. Fischer designed the towers with an art deco theme, an art style from the 1920s and 1930s. Made of aluminum and steel, helicopters were used to place the Sky Stations on top of Bartle Hall at the Kansas City Convention Center.